Fighting fire with more fire -- and a WWF-worthy name -- there's a new champ holding the title of world's hottest chili pepper. As you may recall, in December The Lookout reported on the Naga Viper and its initiation as the chili pepper with the most heat. But now there's a hotter ticket in town: the Trinidad Scorpion Butch T.
Yes, the Butch T. outdistances the Naga Viper, barely, on the Scoville scale -- which rates spice power by tracking the presence of a chemical compound in chilis. The Australian Butch T. weighs in at 1.46 million heat units on the scale, while the British Naga Viper tops out at 1.38 million. For comparison, the average jalapeno pepper falls around 5,000. "They're just severe, absolutely severe," Marcel de Wit, co-owner of the chili farm that produced the pepper, told Australian Geographic. 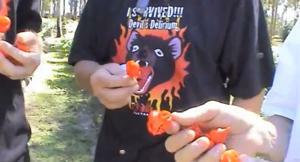 "No wonder they start making crowd-control grenades now with chillies. It's just wicked." He added that the pepper is so potent, he and his his team have to wear protective gloves when handling the Butch T., lest their hands are left "pumping heat for two days later." Making salsa with the Butch T., he explained, involves wearing chemical masks and body suits to defend against fumes given off in the cooking heat. After being given some rare seeds by Aussie farmer Neil Smith, de Wit began cultivating the Butch T. two years ago. The champion chili will also soon be the main ingredient in a stingingly hot sauce called the Scorpion Strike. Here's a video of de Wit and Smith suffering through a sampling of the winning chili.